I have learned how to retain curls even in the dry winter air. Today I’m sharing my healthy hair tips with you, but first I’ll show you what I wore. The weather was bitter cold and snow was falling this afternoon, so I wore several layers, and I added a long wool coat and gloves before making a mad dash to the grocery store. 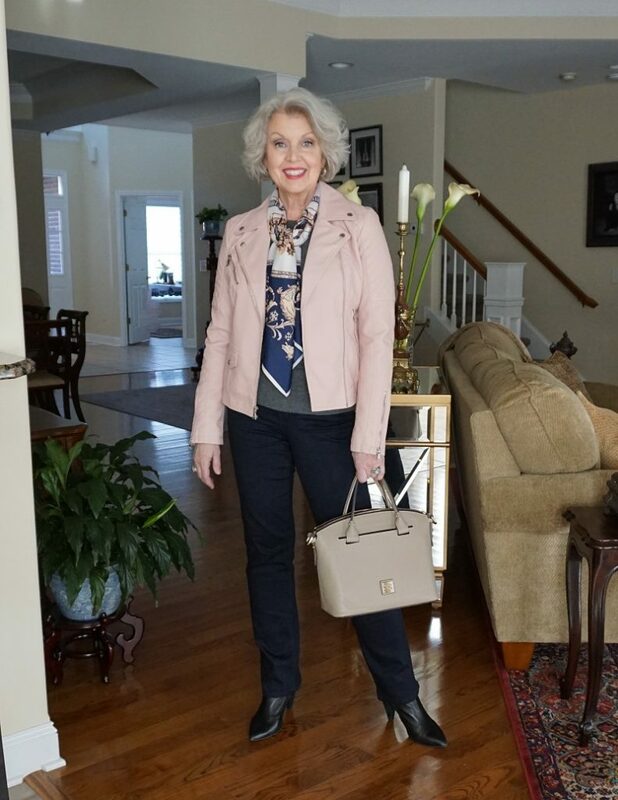 I wear a similar look as shown in the video below on most cold days because it is so easy to layer practically anything over it. I first showed you this pink moto jacket here. The Vintage Pink has almost sold out now, but here is a gray one. I am also wearing a slim fitting long sleeve tee from WHBM here under a cashmere charcoal sweater from Everlane here. The jeans are by Liverpool Jeans Co. here. The short boots are a couple of years old. Similar here. 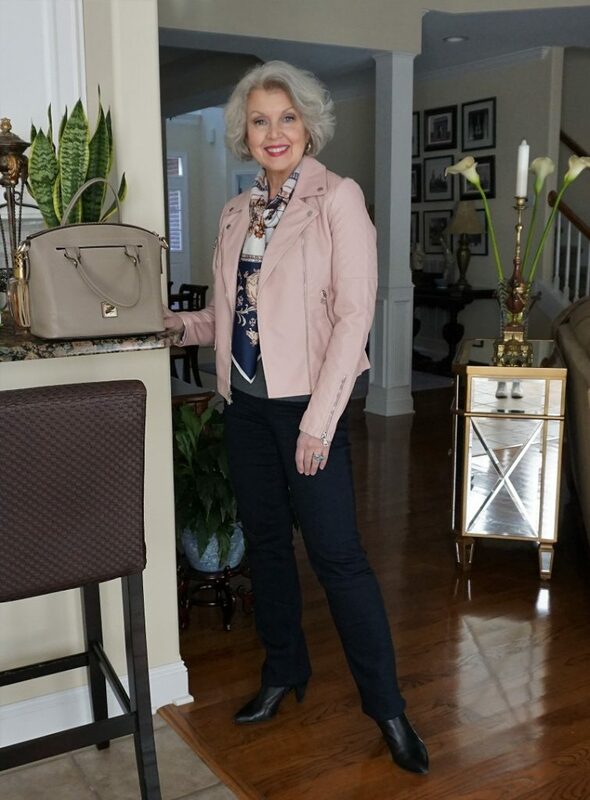 The light taupe Dooney & Bourke bag is now on sale here. The Carriage Ride Through Paris scarf is from my shopping site here. I wear this scarf often because it includes all my favorite neutral colors. It fills in the neckline nicely, and it helps to keep me warm. I share my best tips for maintaining your curls in the video below. 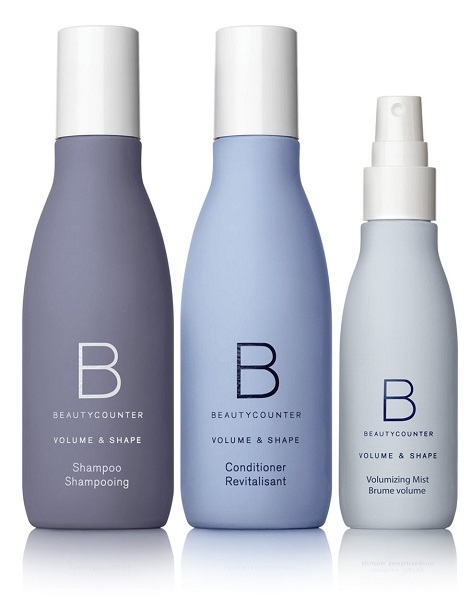 The Beautycounter hair products are the only ones that don’t give me a very itchy scalp. You will find these products here. The purple shampoo I mentioned is from Sally here. 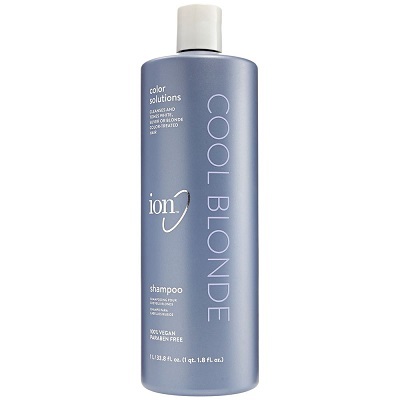 I mix it with my regular shampoo at least once per week to keep my hair from turning a brassy yellow tone. A free satin scarf comes with every purchase from my shopping site here. Beautycounter, found here is my favorite haircare, skincare, and makeup. French Kande makes my favorite jewelry pieces. Visit them here. I modeled for and still wear Covered Perfectly tops often, they are here. 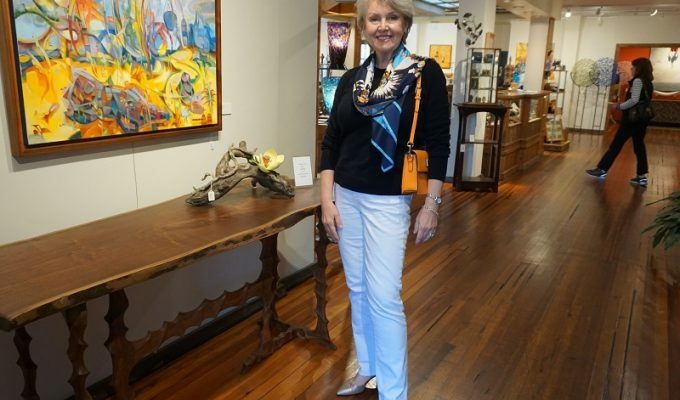 Referral and affiliate links may generate a small commission for Susan After 60 Inc. I like the soft, subdued colors of this outfit. Very appropriate and classy! What pants are you wearing? Thank you for pointing out that I failed to mention the jeans. They are here. I’m thrilled to see this video. I just decided to start trying to wear my hair curly again even tho it’s winter. Do you not recommend a diffuser? What do you do for the front part of your hair around your face? Thank you! I find a diffuser to be too bothersome and burdensome. I use my hands and lift the roots so that it dries without laying too flat. The bangs and the front have always been more straight than the back. Would these products also work on baby fine straight hair? Yes, they are very gentle. Your hair always looks so pretty and a fabulous asset for your chosen endeavor here on this site. The video was interesting and though my hair is quite straight, I use very similar techniques. Thanks. Are the products shown appropriate for color treated hair? Thank you, as always, for sharing your tips. I like your jacket, scarf, hair…very nice! I read excellent reports from users with color treated hair. Numerous people are pleased with the results. 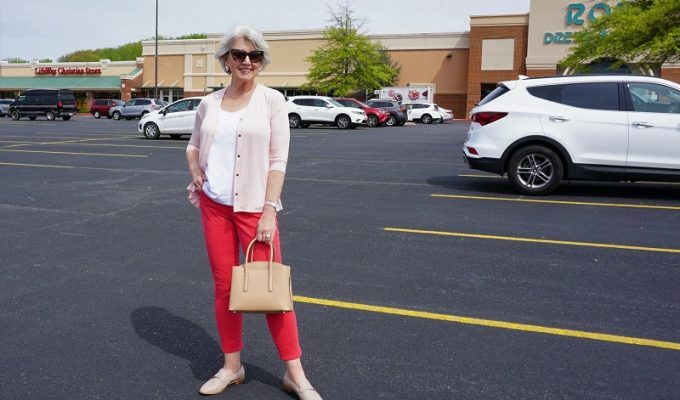 Susan is it appropriate for a 80 year old woman to wear skinny jeans. My friend says they should not be worn.I say they can be worn with a tunic top. If you are happy with the way your legs look in slim fitting pants, I think you should enjoy wearing them with a long tunic as long as you want. Hi again! I remember in an earlier post that you mentioned finding a brow pencil that you really like – one by Bobbi Brown? I need to replace my pencil and want to try something different. I felt like what I had was too dark. My hair color and complexion are much like yours. What color would you recommend? Thank you! I found a soft gray brow pencil at Merle Norman. They have two versions of the pencil and a powder as well. The brow pencil that you can sharpen gives more control. Great ideas for your hair. Thanks for the tips. I am going to try them on my sister’s hair! I do enjoy your demos so much and always learn many helpful ideas. I do like the look of the black handbag which would go so well with the many black clothes I like to wear. …Hoping you will draw my name!!!! Susan in addition to you always looking so lovely, you also have beautiful eyes and a great smile! I am 60 years of age and I wear my hair a little below my shoulders. Is it appropriate to have my hair this length for my age? What is your opinion? How does the long hair make your face look? I try to evaluate things not based on the number of years, but how it makes me look at whatever age I am. Hair that touches my shoulders makes me look very tired. Love your blog. But please don’t put that hairdryer in the sink. That is dangerous. Very nice, susan…thanks for sharing, Susan…love your beautifully decorated home, too. I’m a little confused about how you do the conditioner everyday. So while you’re showering, without a shower cap, you just put a small amount on your hair? And then do the 15 minute drying? My hair becomes progressively straighter from dry winter air. I do rub a minimal amount of conditioner in my palms and then scrunch it into my damp hair and leave it. The moisture of the shower brings back the curls. I don’t dry it on those days because it isn’t thoroughly wet. I often spray this mist (here) into my hair and on my face. I keep it in the fridge, and it feels so refreshing to mist on my tired face during the day. Dryness is the enemy for hair and skin. Thank you. I decorate my home in the same way I purchase clothing and accessories. Buy what you love, keep it for many years, enjoy it many ways. Almost any item in my home can be used in any room. Look for similar items within your budget. Good style has no price tag. It is creativity that matters most. Thank You so much for the hair tip!! I style my hair pretty much the way you do but I work in a cold enviroment and sit by a heater all day, and before you know it my hair is in my face and frizzy. I did find a product called flocker on qvc and it has wax in it so that helps hold my shape longer but the next day I pretty much need to wash it out and start over. Love your step-by-step hair care demo. I want to embrace my waves but it’s really hard to find a stylist who can resist flat-ironing it into submission. When I say I don’t want it straight, they look at me like I’m from Mars! Hello Susan, I like how you style your curls. I’m so glad they arrived. You are most welcome. Thank you for addressing this topic, Susan! I enjoyed the video!